The Queens Envy has recently become a member of the H.A.R.D.C.O.R.E. Team and in getting to know my teammates I am blogging a few of the other member shops. 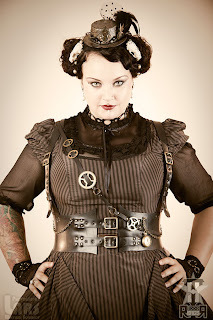 TSRubber is owned by Tanja Schroeder a 46 year old woman who lives on a small island in Denmark. "A very beautiful place, where people take a holiday." Full of old buildings and ancient castles. A place I would love to visit someday. In 2005, Tanja began a job where she worked with children after their schooling. She would teach them arts and crafts and to make gifts for their parents. After two years, she started selling her own designs in small galleries in Denmark. An interest in recycling and reusing, is her inspiration. Tanja receives her used rubber from a local company who makes inner tubes for tractors, harvester combines, etc... The rubber is very dirty when she gets it and gets cleaned 2 -3 times and is then polished with water based silicone. A friend helps in cutting out circles with a special tool and everything is put together with an old industrial Singer shoe sewing machine with some intricate hand work added. I cannot help but get a sense of fantasy seen in such movies as The City of Lost Children or Brazil. 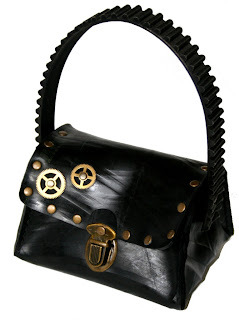 The belts, bags and jewelry designs have a Steampunk, Gothic feel, no doubt attributed to the old castles surrounding Tanja's small island. 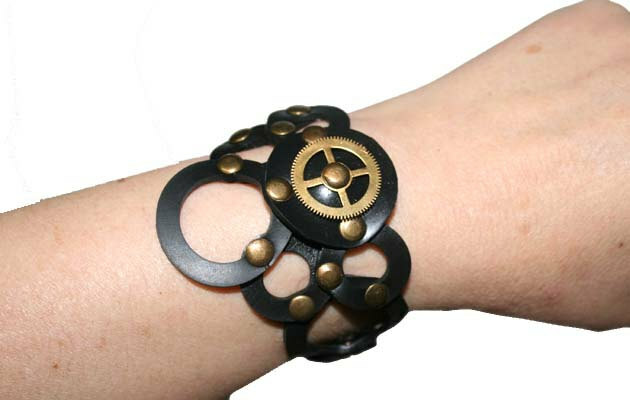 The products are all unique, and some of them are adorned with military jewelry, gears, grommits and found objects. Different textures and patterns from the inner tubes add interest and overlap with original stamps which are still visible on the product. Oh my! As I read each word I am drawn further into the story..........what a beautiful fantasy world Tanja must live in!! Oh anything with castles is where I must go! I am such a romantic and a dreamer.......and our lovely Tanja not only lives in a beautiful place, she is beautiful and futhers herself with her beauty inside by giving of herself to children..then doing her part by helping to save the planet by recycling something one could not imagin to be so beautiful!! Tanja's creations are so unique and shout beauty! Love! Happiness! Also a tad of......well more than a tad of sexiness!! Oh la la~ I love everything she has created in her magical world~ amazing!